Daily Illuminator: Loot With Friends, Shoot With Friends! July 16, 2012: Loot With Friends, Shoot With Friends! From the first dusty room to the last glittery vault, most dungeons are full of danger. Before now, the only sensible thing to do was to trod in fearlessly on your own. However, starting today, you have another option: Send in the guy you brought along for help. With GURPS Dungeon Fantasy 15: Henchmen, you'll have everything you need to create a thousand taverns of would-be helpers: cutpurses, archers, squires, and more. It also includes guys you can hire by the handful, like cultists, guards, and torch-bearers. In addition, it includes a dozen lenses you can use to augment these templates, turning them into monks, troubadours, burglars, etc. This supplement also serves as the key for new character-creation possibilities. Now you can make lower-powered delvers, mixed-power groups, or standard 250-point adventurers. Mix and match the archetypes and lenses for all-new options. In addition, it includes a trove of options for working henchmen into the campaign, rules for recruitment and loyalty, insight into NPC advancement, paying for them with points or money, and more. 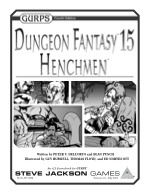 Beef up your undersized parties, trade extra gold or character points for allies, or start a GURPS Dungeon Fantasy game at a more challenging power level -- with GURPS Dungeon Fantasy 15: Henchmen! When you get done fighting whatever fire demons you and your new friends encounter, you can also get behind the wheel of . . . a Firedemon? Yes! 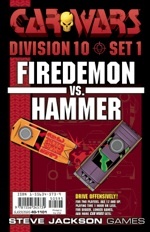 With Car Wars Division 10 Set 1 - Firedemon vs. Hammer -- newly released to e23 -- you'll get two Division 10 cars, including the counters and rules you need to drive offensively in the world of Car Wars. Whether you're looking to loot a dungeon with friends or kill someone who drives too close, e23 has something new to get you revved up!